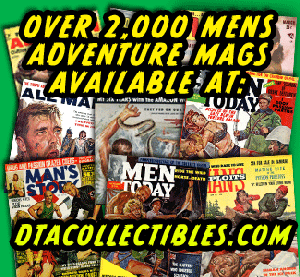 One of the men’s adventure magazine covers that’s a personal favorite of mine (as you can see from the header of this blog) is the May 1957 issue of Man’s Life. The painting on its cover is the epitome of a classic men’s pulp mag formula: vicious killer creatures attacking a manly man and a gorgeous DID (“damsel in distress”). This fits in what I call the “Weasels Ripped My Flesh” subgenre. 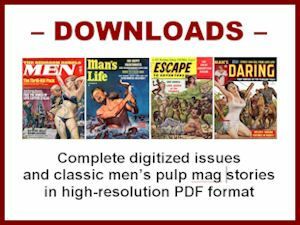 That’s because the most famous example is the cover of the September 1956 issue of Man’s Life. It features the headline “Weasels Ripped My Flesh” and a cover painting of a bleeding, barechested man being attacked by vicious weasels. 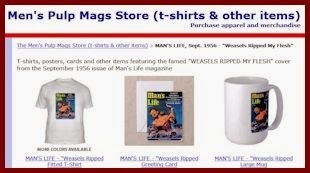 “Weasels Ripped My Flesh” was immortalized by Frank Zappa when he made it the title of a 1970 album. Artist Will Hulsey did both the killer turtles and the killer weasels cover paintings and many other great ones like those. The attacking turtle story that goes with Hulsey’s painting was written by Vic Pate. 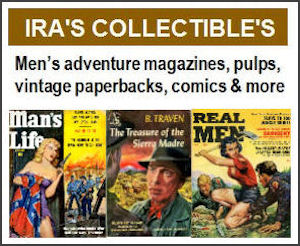 I suspect that’s a pen name for one of the staff writers or freelancers who wrote stories for Man’s Life and other magazines published by Crestwood Publishing (aka Feature Publications). It’s written in the first person as a “true story.” (Though if someone can prove to me it’s really true, I’ll eat my adventure-style pith helmet – which, amazingly, can still be found in an assortment of styles on Amazon.com). 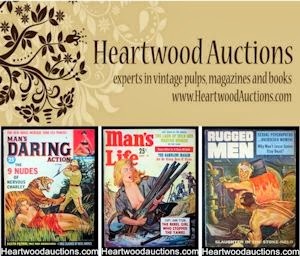 The cover paintings used for many men’s adventure magazines were often bloodier than the stories they were painted for. The yarn is written in a cool, noir-like style. It starts out in Shreveport, Louisiana then moves to the scene of the attack: a muck-bottomed backwater bayou. As the subhead suggests, the story doesn’t end well for our DID and manly man. You can find out what happens by reading it yourself. Just click this link to download it in PDF format.